My family is no stranger to the Coffee Bean & Tea Leaf brand, having enjoyed a variety of their hot and cold blended specialty drinks over the years. For sure, my kids and I never miss a CBT&L open house. For the winter holidays promotion, three specialty beverage drinks are offered: Red Velvet Hot Cocoa, English Toffee Latte, and Winter Dream Tea Latte. They sound so good and are all certified kosher, so I think we'll be tasting each of them Tuesday, November 8 from 4-7 pm at our local coffee house. 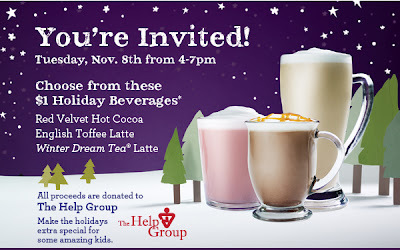 I hope you'll take advantage of this special event invitation, too, at the Coffee Bean closest to you. The new drinks in regular full-size cups will be just $1 for the event. Even better, it's a fundraiser with all proceeds going to the non profit The Help Group. It's the perfect opportunity to try the newest seasonal beverages for a fraction of the regular price and help a worthwhile cause, which really sweetens the deal. I like just about every Coffee Bean drink I've ever tasted, so it's hard to pick a favorite. How about you? Do you have a go-to favorite drink flavor and if so, what is it? Please leave a comment and share. FTC Disclosure: I disclose that I'm a Coffee Bean & Tea Leaf fan and am a loyal customer. This blog did not receive any payment or other compensation associated with this post. See complete FTC Disclosure information that appears at the bottom of MommyBlogExpert's main page and at the bottom of every individual post on this blog, including this one.